Louis Vuitton luggage has been outshone by a rival Parisian label – Goyard when it comes to exclusivity. In fact Karl Lagerfeld who was so devoted to LV Luggage that he had the house make him bespoke trunks to hold his iPods and speaker system has switched over to Goyard. 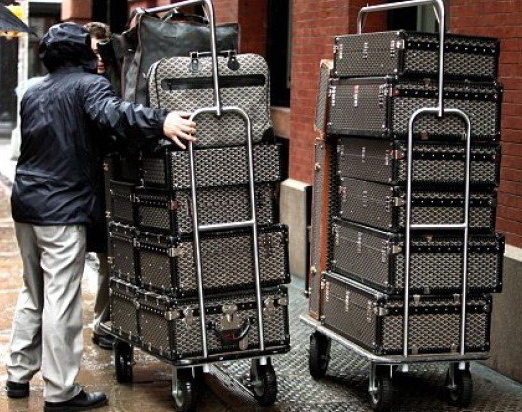 The picture below is that of Lagerfeld’s luggage being taken in to a New York hotel and all of them are Goyard. While every bit as luxurious as Vuitton, Goyard’s wares have not quite captured the popular imagination like those of Vuitton and aren’t nearly as famous; for that reason they can perhaps be said to be more EXCLUSIVE. In place of Vuitton’s famed monogram canvas, Goyard’s cases feature a pattern of interlaced chevrons. Goyard has long had a devoted clientele of celebrities and royalty. Aristocrats such as the Grand Duke of Russia, the Maharajah of Kapurthala and the Duke of Windsor all traveled with Goyard luggage.